In the early 2000s my wife, Susan Leopold, and I started looking for a bit of land and a project. We originally met in 1980, when both of us had summer jobs at the Leopold family’s Shack in central Wisconsin. Early in our life together we started an oak savannah restoration on the Leopold Memorial Reserve, but we’d always wanted to do a project on land we owned and could pass on to our boys. We wanted to act on our lifelong land ethic values, spend time in a re-wilding place, and help to heal a piece of broken land. We started our work at Tarboo Creek in partnerships with Peter Bahls, a biologist with the Northwest Watershed Institute who was making it his life’s work to create a coalition of land owners, conservation / environmental nonprofits, national and state government agencies, and community members to restore Tarboo Creek and its watershed in Jefferson County on Washington state’s Olympic Peninsula. Tarboo Creek’s waters flow into Tarboo Bay, then Dabob Bay and Hood Canal, to the rest of the Puget Sound, and finally the main body of the Pacific Ocean. Much of the creek’s 7.5 mile length had been straightened and ditched to create croplands and pastures, though all of the farms in the watershed had failed by the 1960s. The native coho and chum salmon runs were deeply depressed; steelhead salmon were gone. All that remained of the old-growth western redcedar, Sitka spruce and Douglas fir trees were gigantic stumps, rotting along the streambank. Our sons, Ben and Peter, were 20 and 14 in 2004 when we bought 17 acres: 1,000 feet of Tarboo Creek along with its adjoining floodplain and forested hillside. It wasn’t a “pretty” spot. From a 2008 Seattle Times article: “Walls of blackberry brambles made it hard even to see the ditch-like remains of the creek. The previous owner logged most of the big trees before putting the land up for sale. Someone with a penchant for digging had bulldozed big piles of dirt and excavated two fake ponds. To begin our piece of the overall project, Bahls and his crew organized and orchestrated the excavator work that turned our ditch of a creek back into a meandering stream, complete with logs and other hiding places for salmon. And they “planted” tall snags nearby for birds to perch on and feed on. Once the excavator had moved the earth, our family helped with the handwork of stabilizing and reseeding the new streambank. Then, when the remeandering was done, our entire family—at times joined by community groups, friends, and students from the University of Washington—started hacking blackberry and planting trees along the creek, the floodplain and the former pasture. Susan’s father Carl, a botanist and conservationist himself, joined us and his grandsons for many plantings and creek walks before he died. Over a decade later, Tarboo Creek is beginning to look more like what it once was: clear, meandering at its will, offering cool shade and nesting places for salmon, cutthroat trout, brook lamprey, crayfish and mussels from creek mouth to headwaters. In time, we all began to see bear, bobcat, mink, cougar and deer again using the stream and surrounding forests. 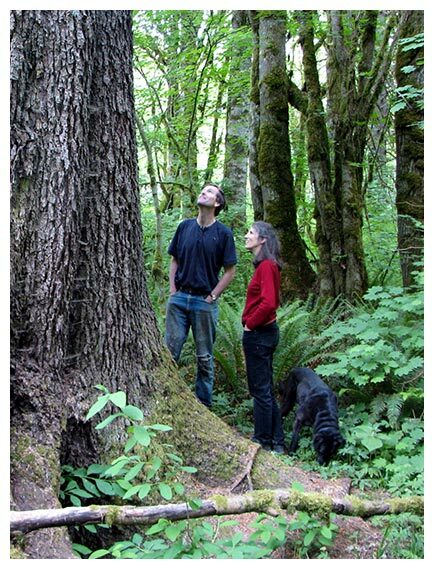 Since starting the watershed project, the Northwest Watershed Institute—led by Bahls and Jude Rubin—has purchased more than 400 acres of restored valley bottom and upland forest and then protected the lands with conservation easements donated to the Jefferson Land Trust, based in Port Townsend, Washington. As a core of its holdings, the Institute manages the Tarboo Wildlife Preserve, a 316-acre field research station and base for its short-and long-term studies. Other watershed land—more than 500 acres by 2017—is owned and managed by individual landowners like us, also protected in perpetuity by conservation easements held by the Jefferson Land Trust. Several thousand additional acres in the watershed are owned and protected by the Washington Department of Fish and Wildlife, and the Washington Department of Natural Resources. The Nature Conservancy and the U.S. Navy have also been key backers of the effort. The project is now considered a model of cooperative, science-based restoration and sustainable stewardship. Scientists and conservationists from across the U.S. and around the world have come to Jefferson County to see the project. The trees are growing; the native fish, birds and mammals are returning. Twelve culverts that previously blocked salmon migrations have been removed and as needed replaced with bridges. More than 3 miles of Tarboo Creek that were ditched and straightened now are reconnected to the surrounding wetlands and meander along over in-stream logs and gravels. Most of the creek’s main channel, and many of the major tributaries, is now protected from development by conservation easement. More than 90,000 native trees have been planted by NWI-organized community and school plant-a-thons; on our property we’ve planted more than 12,000 trees and shrubs with the help of family and friends. Many of the forested tracts in the watershed are being managed for sustainable and selective logging instead of clear cutting. Stands that were once neglected and overgrown are being selectively thinned to increase their long-term health. The work on ongoing: Conversations and negotiations continue to add forested lands and new partners to the region’s conservation stewardship effort. Since buying that first 17 acres and 1,000 feet of creek, Susan and I now own and manage over 240 acres of forestland in Jefferson County, all protected by conservation easements held by Jefferson Land Trust.